Welcome to Japan, a country of shrines and temples, gardens and beaches, onsens and cuisine. It’s a small nation with a massive culture and a vast range of things to see and do in every corner of the country, and a motorhome road trip is easily one of the best ways to see as much of it as possible in one go. This RV itinerary in Japan will start with picking up a motorhome in Tokyo, then taking it for a spin throughout some of the country’s most awe-inspiring locations, as well as many of its lesser known attractions. You can’t go wrong no matter what time of the year you visit, whether you go in spring and enjoy the bright cherry blossoms in bloom, in winter when those onsens are extra attractive, or in summer when every day offers warmth and sunshine. You’ll need a month to make your way around this route, but any extra time you can give yourself will be time well spent. Begin your campervan road trip around Japan in style with a handful of the country’s most eye-opening and memorable sights. When you pick up your motorhome in Tokyo, you’ll have a chance to use it to visit the city’s many incredible attractions before hitting the road and stopping off at Mt Fuji, the city of Nagoya, LEGOLAND, and the hidden Miho Museum. You’ll need as much time as you can spare to see it all, but aim for a week or so to allow enough time to enjoy the best parts of each spot. There truly is no place in the world like Tokyo. With 10 million inhabitants in the city and almost 40 million in the larger metropolitan area, there are more people than you’ve probably ever seen in one place in your life. There are lights, bars, cafes, ads, towers, and skyscrapers in every direction, and more attractions than you could visit in a month. Begin your visit with some of the best views in town with a trip the Tokyo Tower, an Eiffel-Tower-like structure in the Minato district that’s the second-tallest structure in Japan. Then take it one step higher and visit the tallest structure in the country, the Tokyo Skytree, which sits at 634 metres and also happens to be the world’s tallest tower. You’ll visit plenty of beautiful temples throughout this motorhome road trip, and there’s no better place to start than with Senso-Ji, Tokyo’s oldest, and by far one of the most colourful and popular. Of course, it’s not a trip to Tokyo without an evening spent exploring Harajuku, a lively, colourful, fashionable, artsy and downright crazy area known for its shops and arts scene. After the riot of colour and noise that is Harajuku and Tokyo’s main streets, make your way to the blissful Oenu Park, where you can rent a boat, visit a museum, or check out the zoo. There is no real end to the attractions on offer in Tokyo, but once you can drag yourself away, head south out of the city and take the Tomei Expressway to your next destination. 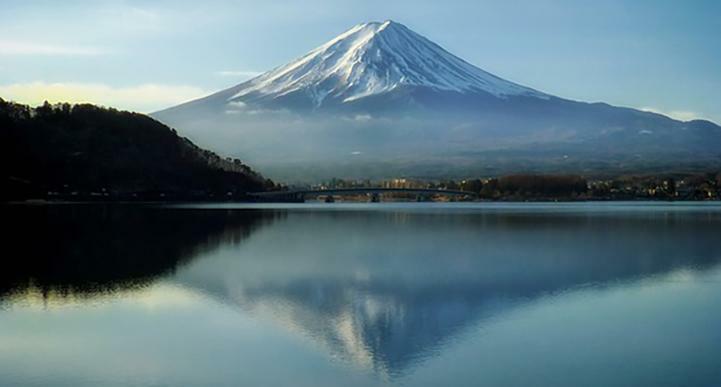 Just 100 kilometres out of Tokyo likes Mt Fuji, an active volcano and a towering stalwart on the Japanese landscape. The volcano is 3,776 metres high and the tallest mountain in the country, and is even more spectacular for its height as it stands alone. Naturally, it has been regarded with honour for centuries, and is a favourite spot for artists and photographers, nature-lovers and sightseers alike. It last erupted over 300 years ago, and today is considered dormant. Sadly, those clear-sky photos of the noticeably symmetrical peak are more rare than you might think, as the mountain is often shrouded with clouds or bad weather. It’s usually clearest during the cooler months, and in the early morning or late evening, so try to align your arrival with an auspicious time for the best view. Next, head back to the main road and continue south, following it as it turns into the Isewangan Expressway (a toll road) and makes it way to Nagoya. Nagoya is the busy capital city of the Aichi Prefecture, and was once known largely for its shipping and industry, but has increasingly made a name for itself for its tourism, too. Start with a stroll around the district of Osu, which is known for its numerous shrines and temples, as well as traditional shops filled with crafts and food. The city’s main attraction however is Nagoya Castle, a spectacular structure that is one of the largest in the country. After a fire destroyed much of the original building, it was rebuilt in the same style and now houses a museum devoted to the site’s history, and it exists today as one of the best viewing spots (hanami) for viewing cherry blossoms in spring. Finally, swing by the waterfront that helped make Nagoya the powerhouse city that it is today, the Port of Nagoya. Here you can stroll around the walkways to get a feel for the area, visit the wildflower garden, take a spin on some of the rides at the small amusement park, check out the aquarium, and climb about the historic Fuji, an old Antarctic fishing vessel that now serves as a museum of the South Pole. From here, it’s only a short drive a little farther along the Isewangan Expressway to your next destination. As much as LEGOLAND is certainly advertised as being all about children and families, there is absolutely no shame in living out your childhood dreams even if you aren’t travelling with minors. There are 17 million LEGO blocks throughout the park, and you’ll find them in models you can touch, models you can create, rides, shows, and more. Especially enjoyable for anyone completing a motorhome road trip around Japan is Miniland, a space where you’ll find recreated versions of the country’s most loved cities and destinations. Book your ticket online in advance to save on the cost of admission, and get your own LEGO brick engraved at Pick-A-Brick before you leave for a unique souvenir of your visit. From here, it’s just over an hour southwest to your next destination for a brief and unique detour. The Miho Museum is a place you visit as much for its content as for the building itself. The structure was designed by acclaimed architect I.M. 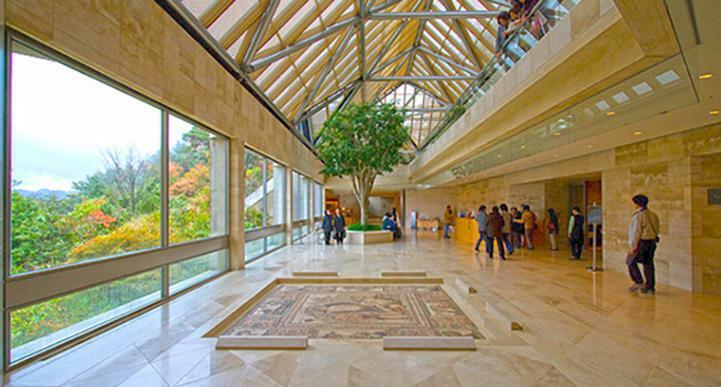 Pei, who is most notable for his work on the glass pyramid found outside the Louvre Museum in Paris. It’s a bit like an iceberg, with 80 per cent of the building underground, and the part that is above ground is buried deep within a nature preserve, tucked away from the main tourist trail. When you arrive, you’ll pass through a futuristic silver tunnel, cross a mesmerising suspension bridge, then enter the upper layer of the building. Inside, you’ll find Mihoko Koyama’s private collection of Western and Asian antiques. Mihoko, a Japanese heiress and lover of the arts, had always dreamed about such a museum, so commissioned the building that would eventually take inspiration from her name. Together, it’s a celebration of history, nature and art, and not to be missed on a short detour on your way to Nara. 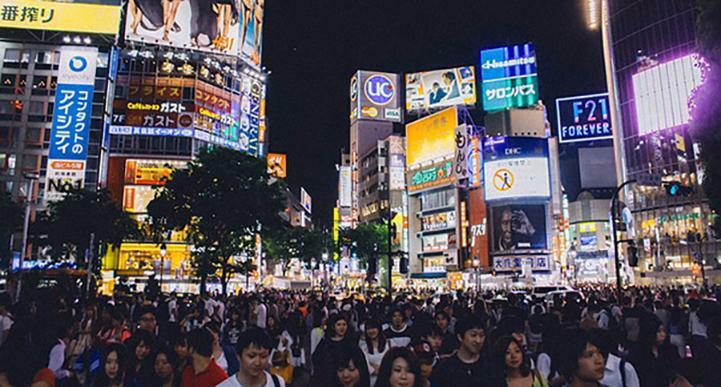 Leg two of your Tokyo round trip is the perfect Japan-in-a-nutshell experience. It begins in a bustling city that was once the capital of the country and is now known for its gorgeous tame deer, then moves on to a couple of unbelievable castles, a world-renowned aquarium, and a relaxing onsen. Several of these attractions are extremely popular, so aim to arrive early in the morning to beat the rush whenever possible. You’ll only need a day or so at each spot, but there’s no need to hurry if you prefer to sit back and spend a little more time in your favourite places. Nara was once the capital of Japan, and even though it lost this title in 784 to Nagaoka, the city still retains an impressive display of history, art and culture. 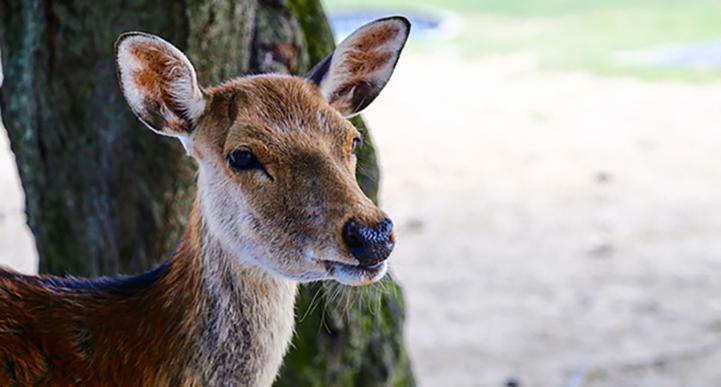 Today, it’s often most commonly known around the world as the home of the famous Nara Park, a large central green space where you’ll find multiple museums and attractions (more on those in a minute), as well as its main feature, hundreds of roaming deer. There are more than 1,200 deer that live in the park, and they have become so used to the presence of humans that many will happily feed from your hands. You can purchase special deer crackers at the park so don’t be tempted to bring your own snacks that could be harmful to the animals. The park is also where you’ll find the Todaiji Temple, another of the city’s top sights. It was initially built in 752 to be the head of all the Buddhist temples in the country, but eventually became so influential that the capital city was moved away from Nara to lessen the temple’s power in politics. Inside the structure you’ll find a 15-metre tall bronze Buddha (one of Japan’s largest), and the main hall, which is the biggest wooden building in the world. Before you leave the park, also stop by the Nara National Museum, a beautiful old building that houses a huge collection of Buddhist art and artifacts. Heading west out of the city, you’ll take the Daini Hanna toll road towards Osaka. When the Osaka Castle was built in 1583, it was intended to become the centre of the new Japan. Unfortunately, even though it was the biggest castle in the country at the time, this optimistic plan didn’t come to fruition, and the structure was attacked and destroyed just 15 years later. It was soon rebuilt - only to burn down again after an unfortunate lightning strike. It was rebuilt again, and has remained standing to this day. As well as its fascinating history, the castle is in a uniquely beautiful location, and is another of Japan’s top locations for appreciating the blossoms in springtime. Next, pass through the city and head to the waterfront to see one of the most widely acclaimed aquariums in the world. 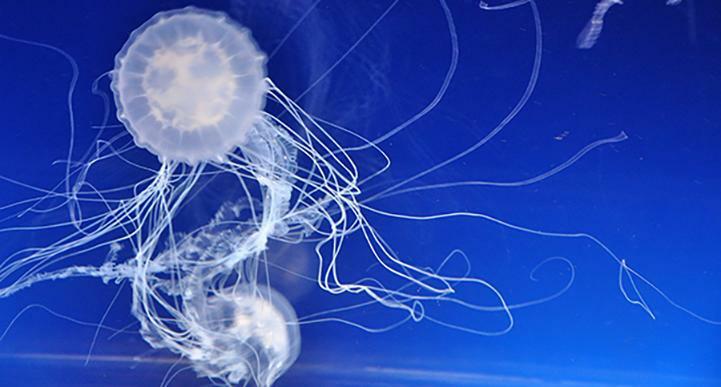 The Osaka Aquarium is known as one of the best aquariums in the world. There are 15 tanks in total, some of which cover the space of several floors, each representing an area of the Pacific Rim. The central tank includes the local celebrity whale shark, and is 9 metres deep. You can walk through the ‘Aqua Gate’, a massive tunnel where you can watch ocean life swim all around and above you, and enjoy a meal at the on-site restaurant with a view of another of the tanks. If you can, aim to be at the aquarium at sunset for an awesome view over the port at the end of the day. After the aquarium, you’ll take a scenic route over bridges and along the waterfront around Osaka Bay, then turn inland onto the Rokko toll road. After at least a week of mind-boggling sights and history, attractions and experiences, you’re sure to be ready for some good old rest and relaxation. Arima Onsen is a small town that’s based on a natural hot spring, and you can either take a luxurious dip in one of the public bath houses, or at one of the ryokan - Japanese style inns - that open their doors to travellers during the day even if you aren’t staying with them. Take a stroll around the cute streets and stop by the hot spring museum for a taste of the history of this famous Japanese tradition before getting back on the road. From here, it’s just an hour along the Sanyo Expressway to your next stop. The Himeji Castle dates back to 1333, and became a UNESCO World Heritage Site in 1993 (one of Japan’s first). It is widely regarded as the most elegant, spectacular and impressive castle in Japan, largely due to its huge size and white exteriors that also earned it the nickname of ‘White Heron Castle’. Naturally, it is also a listed national treasure. Another incredible fact about this castle is that unlike the grand majority of structures around the country, it was never destroyed by fires, wars, or earthquakes, and as such is one of just 12 surviving original castles. You can explore the elaborate grounds and the castle, although keep in mind that this is one of the most visited sites in Japan, so it can get busy. 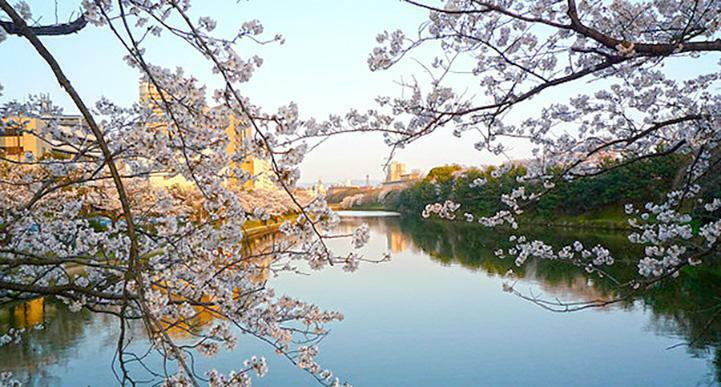 During Golden Week (from the end of April through the first few days of May), and during cherry blossom season, you can expect to wait a while for admission, so aim to get there early in the morning and line up to beat the rush. Next, rejoin the Sanyo Expressway and follow it west for a few hours to begin the next leg of your campervan road trip through Japan. From sombre to seriously relaxing, this leg of your Japan journey features a little bit of everything. You’ll begin in Hiroshima for a chance to learn more about the city’s dark history and to pay your respects, before moving on with your drive to explore some of the country’s raw beauty in the Yabakei Gorge. 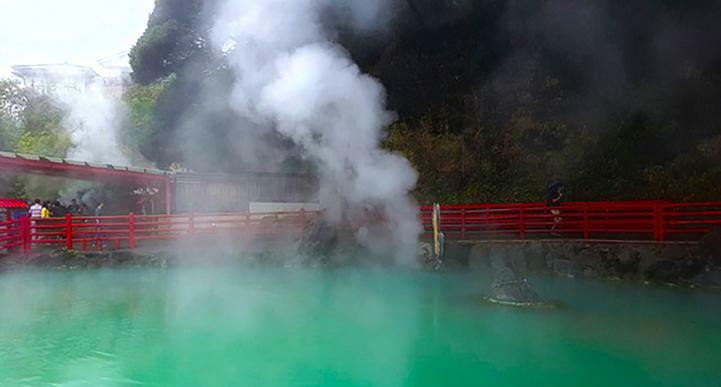 The last stop of this leg will take you to Japan’s onsen capital Beppu, where you can discover the joys of geothermal activity through relaxation, sightseeing, and even food. Give yourself at least five days to a week to cover this portion of your motorhome tour for the full experience. Hiroshima is a name known around the world and a testament against the horrors of war. The atomic bombings of 1945 are one of the reasons why Japan is such a peace-loving nation today, and many of its major attractions are those that commemorate the lost and promote peace and harmony. Your visit to the city will no doubt make you uncomfortable at times, but it’s one of the most important and meaningful experiences of the entire trip. Make the Hiroshima Peace Memorial Museum your first stop for an introduction into the city’s history and insights into nuclear warfare in current times. From here, head to the Atomic Bomb Dome, the only structure left as it was after bombing, which was also just 160 metres from where the bomb dropped. It is clear to see the raw power of nuclear weaponry, and not hard to imagine the sheer terror and havoc suffered by those within at the time. Afterwards, it is recommended you take a stroll in the peaceful and quiet Hiroshima Peace Memorial Park, which was once a busy part of town but was obliterated in the attack, and now stands as a sobering place of reflection. 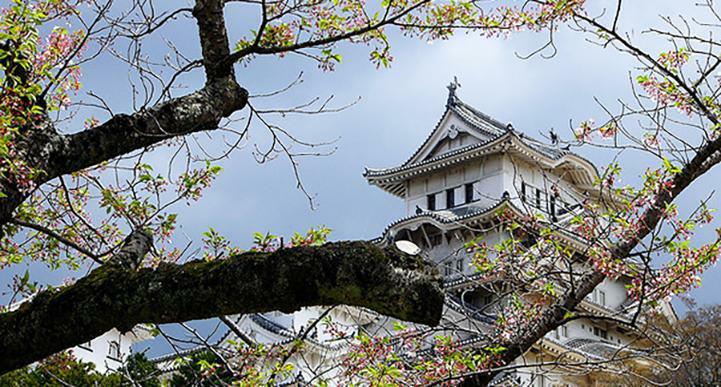 Of course, there is more to this city than sombre memories, and you can lift your spirits and see the power of human resilience with visits to the Hiroshima Castle, the lively Okonomi-mura food theme park, and the beautiful Shukkeien Garden. 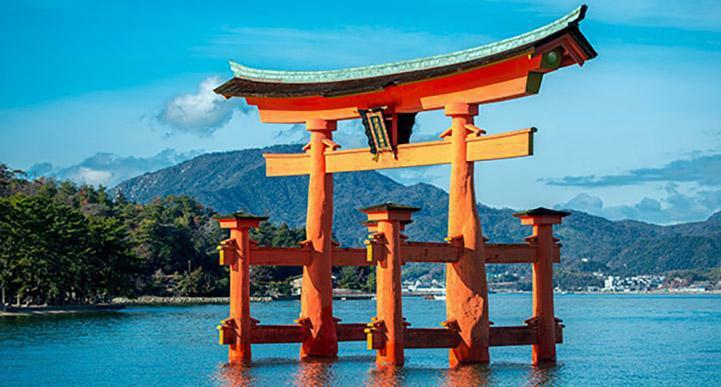 Finally, you can’t leave Hiroshima without visiting the great Torii gate at Itsukushima Shrine, which is a boundary between the human and spirit worlds, and looks like it’s floating when the tide comes up. The torii gate is one of Japan’s three ‘Scenic Views’ - but not the last of these views you’ll enjoy on this road trip. Leaving the city, you’ll take the Hiroshima-Iwakuni Road south. It’s not often that a bridge becomes renowned as an attraction in its own right, but that’s exactly what the Kintai Bridge is. This unique and gorgeous structure features five wooden arches held up by large stone pillars over the Nishiki River, and offers a fun detour during your drive. You’ll need to get out and walk, as this is a footbridge only, and be prepared to pay a small fee to cross. It costs 300 yen (less than USD$3) to go over and back, or you can visit the nearby castle and ropeway as well as the bridge for 940 yen. 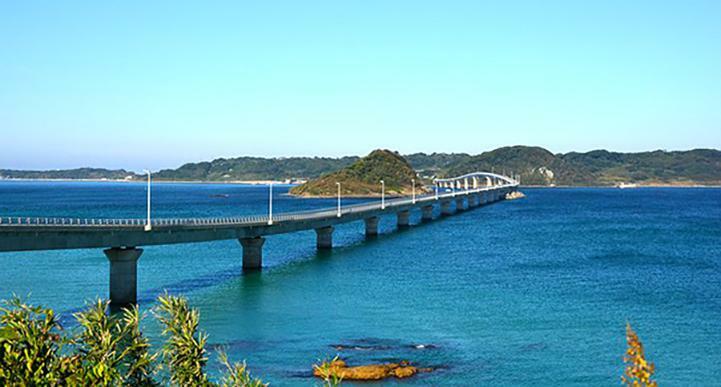 After you leave the Kintai Bridge, pass over the impressive Kanmon Bridge, head south-east, then take a right turn off the Higashi-Kyushu Highway to make your way to Yabakei. As you go along Route 16, take a very short detour to Aonodomon. Aonodomon will seem like a small and plain tunnel that passes under Kyushu Peak. However, this tunnel was in fact built by a monk who spent 30 years with nothing but a hammer and chisel, all in order to create a safer path to the Rakanji Temple. The tunnel has been widened in more recent times to allow for motor vehicles to pass through, but the story behind it remains spectacular. There are parking spaces nearby, so you’ll be able to get out and take a closer look and snap plenty of photos. It’s only a short drive from here back down the main road to reach Yabakei. You’ll pass through the Yabakei Gorge on your way to Beppu, and it won’t take you long to realise why the area is a nationally designated Place of Scenic Beauty. The gorge has been created by millions of years of the Yamakuni River carving out a path through volcanic lava, and the result is a range of unique rock formations, caves and cliffs. There are at least 60 scenic spots along the way, as well as walking paths, hot springs and cycling routes. You can easily pass through this lush area and stop for a few photos here and there, or take a full day to stop and explore on foot to see more of its natural beauty. When you’re ready to keep moving, take the Oita Expressway on to Beppu. Beppu is a seaside city known primarily for its hot springs. There are more vents in this city than in any other spot in Japan, which is why it’s home to more than 2,000 single onsens, and produces roughly 130,000 tons of geothermally heated hot water every single day. Naturally, a visit to any one (or many) of the onsens is a must, but keep in mind that there’s actually more than one ‘type’ of onsen. As well as the usual hot water baths, you’ll also find hot mud and hot sand baths, so be sure to try one of these for something truly unique. Another great geothermal spot is the Hells of Beppu. While these springs are far too hot to offer safe bathing, they do make for a spectacular sight. When you’re ready for a break from all that relaxation, make your way to Kijima Kogen, an adventure park, to bring your heart rate all the way back up. It includes the country’s first wooden roller coaster, plenty of fun rides, and a scenic backdrop to boot. And finally, before you go, stop off at any one of the restaurants that uses the hot springs to cook your meal. You can even stop by the Jigokumushi Kobo Steam Cooking Center and cook your own meals with this natural heat source! Finally, you’ll need to head back up the road you came in on, then turn westwards and drive a few hours west to Nagasaki. During leg four of your RV tour of Japan, you turn around and start making your way back towards Tokyo. 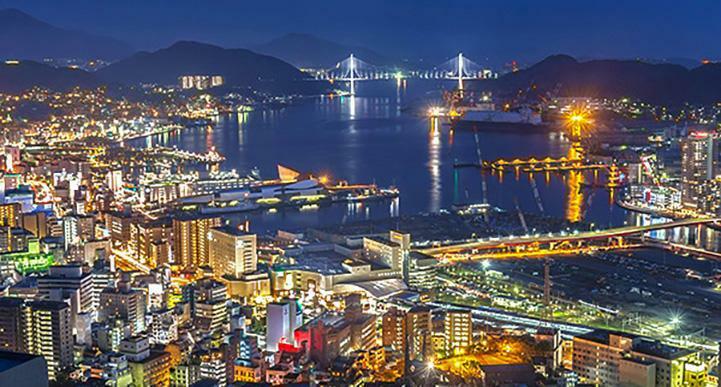 Along the way, you’ll spend a little time exploring Nagasaki, before visiting the ruins of a grand old castle, and a tucked away temple with what could be the largest bronze statue in the world. Your final stop during the leg is on an island that you’ll struggle to believe is even part of Japan, thanks to its tropical aqua waters and inviting white sandy beaches. Take your time on the island and recharge your batteries by the beach before making the final drive up the coast to Matsue. Much like Hiroshima, Nagasaki is a city that has suffered through the terrors of nuclear war, and its current culture is a mix of respecting the past and looking forward to the future. The Nagasaki Atomic Bomb Museum pays tribute to the lives and culture lost in August 1945, and the Nagasaki Peace Park is a tranquil place that marks the spot where the bomb fell, and promotes peace for all future generations. As well as these respectful sites for the past, the city is overflowing with fantastic historic and modern attractions. One unique spot is Hashima Island, one of many small islands off the coastline that has been completely abandoned by humans and left to its own devices. What was once a bustling town is now a desolate and surreal array of worn-out apartment buildings and crumbling offices, making for a truly bizarre and interesting day of exploration. Another of Nagasaki’s unique attractions is the Museum of Tropical Medicine, which pays homage to all the bizarre, terrifying, and dangerous diseases, insects and animals of the tropics. You’ll see all sorts of creepy crawlies and creatures suspended in jars of formaldehyde, and learn a thing or two about strange diseases you might never have heard of otherwise. After the city, take the Nagasaki Expressway north and turn off towards the coastline and Fukuoka. By this point in the trip, you’ll have already seen a number of spectacular castles. The different thing about this one however, is that you’ll be visiting the Fukuoka Castle Ruins. Once upon a time, this castle was the largest on Kyushu (Japan’s third largest island), and covered 47,000 square metres and featured no less than 47 turrets. It was completed in 1607 and was in use until 1871, at which point it was decommissioned and left to ruin. Today, just a few turrets remain, so you can explore the grounds to see the ruins, and stroll through the beautiful gardens and nearby lake. As a bonus, admission is free and it’s always open. From here it’s a short drive north and a quick detour inland to your next stop. The Nanzoin Temple is somewhat off the beaten track, and it has only really recently become more well-known, mostly because the temple is hidden away on a hillside by a tiny village away from main cities. That said, the temple is fast becoming a favourite stop for motorhome road trips around Japan, all thanks to one large buddha. The bronze Nanzoin Reclining Buddha Statue is in fact believed to be the largest in the world. It weighs roughly 300 tons and is 41 metres long and 11 metres high, although it doesn’t carry quite the same history as many of Japan’s other giant buddha statues, as it was completed in 1995. The temple and surrounds are well worth visiting even without this impressive statue, as the mountainside is scattered with lush forestland and the site is equally covered in other (though smaller) buddha statues. Drive back down the road you came in on, then turn right onto the Kyushu Expressway to head north. Tsunoshima Island is a place that will completely change your perception of what Japan has to offer. Even after hundreds of kilometres and dozens of amazing sights, this island will add something new. Looking at it, you might think you’re somewhere in Fiji or Hawaii, with its clear blue waters and soft golden-white sands. The bridge to get to the island is almost 2,000 metres long and is a sight in its own right, but people really come for the beaches and the scenery. You can go swimming, laze on the beach, go fishing, take walks, and generally catch up on your down time. Note that the current campground on the island only offers cabins for rent and spaces to pitch a tent, but there are various spaces on the island where you’ll be able to park overnight. The real benefit of staying overnight is that you get to enjoy the beach in the early morning and late evening when the day-time crowds aren’t there! To finish the leg, you can take the coastal route all the way north to Matsue, but note that this way takes roughly 45 minutes longer than if you drive inland and take the Chugoku Expressway. As you make your way back up to Tokyo, this leg of the road trip will serve as the perfect reminder as to why the most direct route is almost never the most interesting one. This winding drive filled with detours and stopovers will introduce you to some of Japan’s most impressive sand dunes and a sand museum that’s arguably even more impressive than the natural wonder just outside. You’ll stop by the second of Japan’s ‘Scenic Views’ when you visit Amanohashidate, and you’ll explore the sights of Kyoto for a few days before finishing up with the leg. Matsue is a small city found on the shores of Lake Shinji, but it’s also just a stone’s throw from the Sea of Japan, which is how it won its nickname of ‘The Water City’. Naturally, the city has its own impressive Matsue Castle, which is another of the dozen surviving original castles in Japan. This structure is also known as the ‘Black Castle’ for its dark colours, and as well as touring inside, the best thing to do during a visit is to take a boat ride around the moat. The Adachi Museum of Art is another top pick, as much for its beautiful collection of modern Japanese art as for its unbelievably well-manicured gardens, which are known as a ‘living Japanese painting’ for their perfection and style. Lake Shinji is also a big attraction here. While it’s known for its fishing, the main attraction is the spectacular sunset at the end of each day. Grab a spot on the Matsue Bridge for a guaranteed show, or better yet, take a sunset cruise on the lake for the best view in town. From here, take the San-In Road north for roughly two hours to reach your next stop. The Tottori Sand Dunes are the largest in Japan, running 16 kilometres along the coastline in a wave of deep gold that will make you feel like you’ve stepped onto another planet. You can explore them on foot, or be a little more adventurous and take a camel ride, or even try sandboarding. 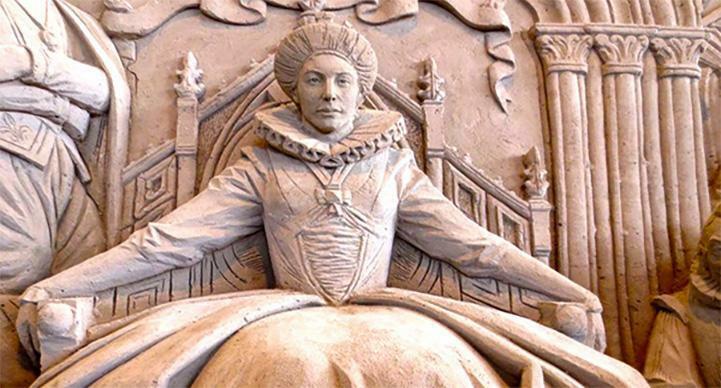 After an adventure on these amazing natural features, make your way to the Sand Museum, the very first indoor sand sculpture attraction in the world. These aren’t your average beachside, foot-high, bucket-castles - these are massive 10-feet high replicas of buildings, people, statues and more, all built from the sand just outside the front door. The sculptures are changed once per year, and always revolve around a certain theme. You will be absolutely blown away by the incredible skill and patience that is apparent throughout the museum, and it will inspire you to head out and build something of your own! Once you’ve finished your own sandcastle on the beach, head back to the main road and continue driving up the coastline. Amanohashidate is a thin stretch of sand covered with pine trees that stretches out into Miyazu Bay. 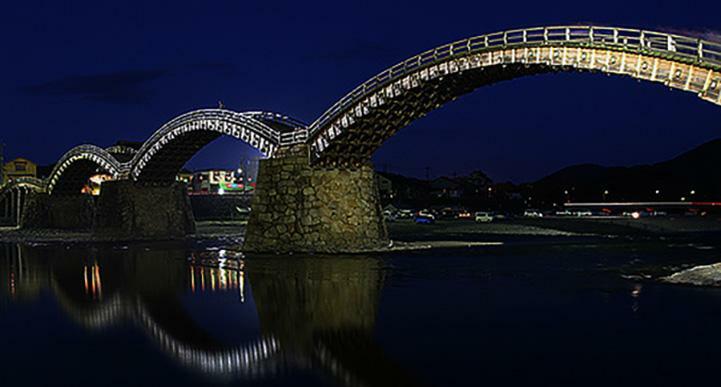 Its name translated means ‘bridge in heaven’, and this is the second of Japan’s ‘Scenic Views’ along your road trip. This picturesque spot has been admired throughout the centuries, and you can join in the ranks of appreciative viewers from the nearby mountains where you will best be able to see the entire sand bar. Afterwards, head down to the waterfront so you can walk across Amanohashidate on foot. There are also a couple of temples, a small amusement park, a shrine, and observation decks by the bay, so you can easily while away a full day at this gorgeous spot. Next up, get ready for a big city and take the Tanba-Ayabe Road south to Kyoto. Kyoto is one of Japan’s top spots for everything from peaceful shrines to non-stop nightlife and mind-boggling views. You’ll need as much time in this city as you can spare in order to catch as much of its culture, cuisine and experiences as possible. Begin your tour with a visit to Fushimi Inari-taisha, an important Shinto shrine that you’ve probably already seen dozens of times on travel blogs. This is the site of the 233-metre long trail of beautiful orange torii gates that leads into the forest of Mount Inari, which is as much a sacred and wonderful location as it is an unmissable photo opportunity. Another famous location is the Arashiyama Bamboo Grove at the base of the Arashiyama Mountains in the west of Kyoto. You’ll stroll through the natural cave of towering bamboo trees as the light filters through the slim trunks and wonder if you’re still on the same planet. The grove is an incredibly relaxing and natural space that makes for a good stop when you simply need to feel rejuvenated. Next, make your way to the Kiyomizu Temple, a UNESCO World Heritage Site and one of the most important temples in Japan. It's known for its natural scenery, history that dates back to 780, and lively shops and restaurants throughout the Higashiyama District that you’ll walk through on the way to the temple. Finally, take a walk in Gion, the city’s entertainment hub. It is filled with shrines, teahouses, bars, and restaurants in a fantastic mix of the traditional with the modern, including many geisha making their way around the district. Finally, spend a few hours driving northwest to your final leg of the trip, beginning at Kenroku-en. This final leg of your drive will begin in Kanazawa at one of Japan’s most admired landscaped gardens. 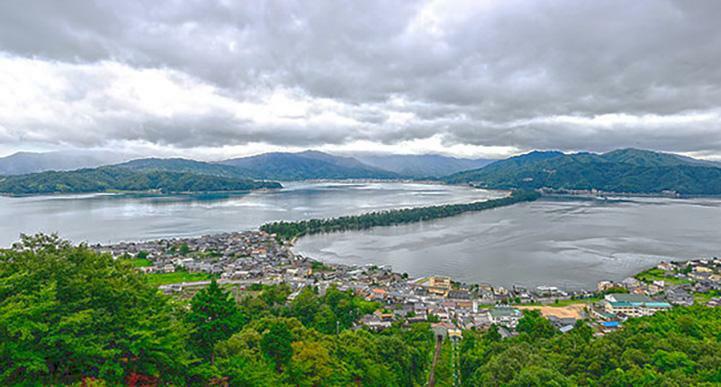 From there, you’ll drive to the Kiso Valley to take a step back in time in the villages and towns along the way, and to take in a little more of the gorgeous natural landscape through this region of the country. Your final stop is a grand and very old castle - a fitting end to a road trip of history, culture, and beauty. If you have time before returning your motorhome in Tokyo, you may even be able to visit a few of your favourite spots there again, or check out the ones you missed at the start of your trip. 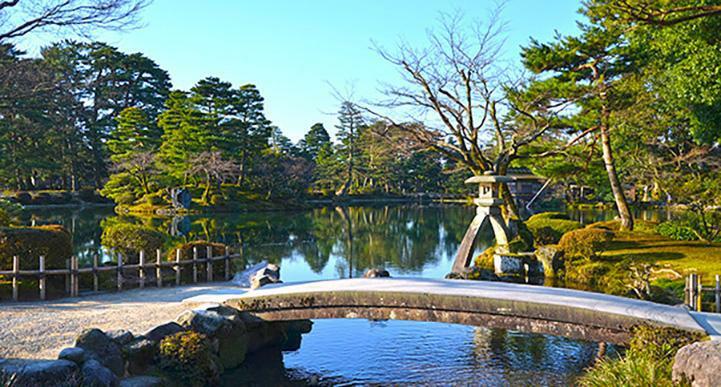 Japan is a country of endless beautiful landscaped gardens, but few are as sublime as Kenrokuen in Kanazawa. The name itself means ‘Garden of Six Sublimities’, which refers to the Chinese garden theory that six features must be included for the perfect garden: abundant water, broad views, antiquity, spaciousness, seclusion, and artificiality. 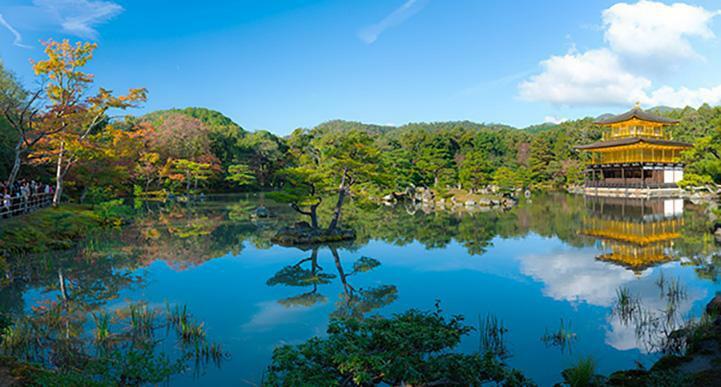 Kenrokuen Garden offers these attributes in spades, which has helped earn it a spot in the top three list of ‘Japan’s most beautiful landscape gardens’. As you stroll around, you’ll spot everything from water features and lanterns to hidden corners, tea houses, viewing spots, and all the trees, flowers and shrubbery you could wish for. The grounds were once part of the outer garden of the Kanazawa Castle, but have now become an attraction in their own right. Be sure to pack a picnic and spend an afternoon relaxing and enjoying this stunning space. When you leave Kanazawa, take the Hokuriku Expressway northeast, then turn inland on the Tokai-Hokuriku Expressway. The Kiso Valley is a true hidden gem of Japan. This is a place where you can park your motorhome rental, stretch your legs, and soak in the serene scenery around you. The valley was once part of an important trade route that ran from Kyoto to Edo, and thanks to shogunate restrictions, traders and travellers were required to make the journey on foot, which naturally saw a boom in ‘post’ towns along the way for breaks. Today, the area is of huge historical significance, and you can still appreciate some of these towns during your trips. 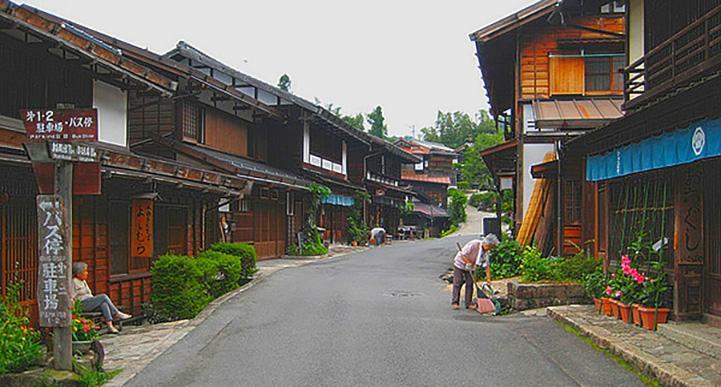 Tsumago is one of these towns, and it is known today as one of the best preserved in the country. Cars are prohibited in the centre, all signs of modern technology are tucked neatly out of sight, so your wander through the village will look just as it did hundreds of years ago. Next, head north via the Chuo Main Line to your final castle - and final stop - of your journey. 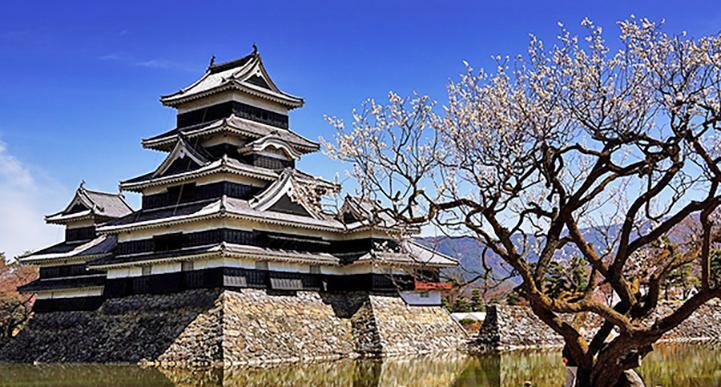 It’s the last stop and the last castle of your motorhome road trip through Japan, but it certainly is one to remember. Matsumoto Castle is the oldest donjon castle remaining in the country, and it is one of just four castles named as National Treasures. The interiors are wood, so when you take a peek inside it will offer that authentic feel that you can’t find in many other castles that have been rebuilt from ferro-concrete. On the outside, the structure strikes an imposing view with its black and white turrets and large moat. Due to the site’s popularity, aim to arrive early in the morning or later in the day towards closing time (last entry is at 4.30pm). And if you don’t mind sticking around or have the time to pop back later in the evening, the castle is beautifully illuminated at night and well-worth a return visit for a few final snaps from your trip. From here, it’s just a few hours west back to Tokyo to check out any sights you missed during your first visit, and to finally return your motorhome. This campervan road trip around Japan will take you at least a month, but it hardly takes a day to fall in love with this incredible country. You’ll fall for its temples and gardens, its cities and scenery at every turn of the wheel as you make your way from Tokyo, down to the south of the nation, then back up again in the most interesting and enjoyable fashion around. It’s only natural to feel a little sadness as it all comes to an end, but there is one way to battle the end-of-tour blues: start planning your next motorhome road trip adventure.